The South Island of New Zealand is known as the more rugged of the two islands of New Zealand. Less populated with people; more populated with dramatic landscapes– it seemed like everywhere we drove, we were surrounded by impossibly blue lakes, impressive glaciers, and enough hikes to last the rest of life. In fact, 30% of New Zealand is protected and managed by the Department of Conservation (DOC). Can you find me? This is one of my favorite photos shot because it reminds me of just how immense and powerful nature is compared to us little tiny human beings. 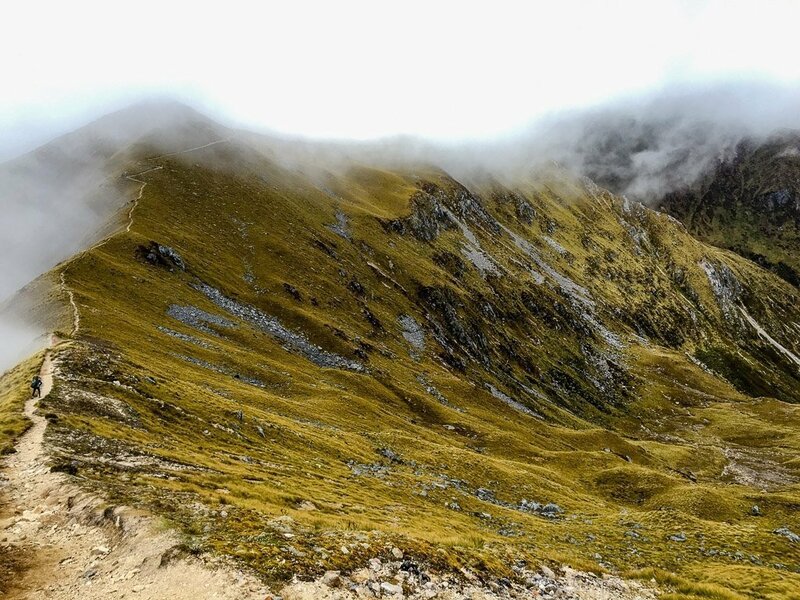 We decided to walk the Kepler Track, which is meant to be a 3-4 day, 60km hike around the Fiordland areas. The DOC operates nine of what is known as the ‘Great Walks’, with campgrounds or hut facilities scattered throughout. It is a great way to experience nature at it’s purest, without having to be a hard-core backcountry hiker. You’re given a map with anticipated elevation gain/ distance/times, the trails are clearly marked and maintained, and there are dependable water sources. With all that, there is still just enough unpredictability to make you appreciate the rawness and power of nature. I think everyone should experience a multi-day hike at some point, and there is no better place than in New Zealand. Like Americans watch baseball, it seems the Kiwi’s explore the outdoors. A way of life. Kaikoura is a small city on the north-eastern coast of the South Island. While it is probably a cool town with nice people, we didn’t see much of it as we headed straight to Oahu Point to watch seals sunbathing. The rocky shores of New Zealand have a healthy population of New Zealand fur seals and their population is strengthening since they were almost driven to extinction before the 1970’s. I love to watch animals interact with each other so I could literally spend the entire day here: cooing at the little babies who just want to follow their mamas, secretly yelling at the dominant males protecting their “territory”, creepily staring at seals while they try to sleep in peace. I am an animal lover/stalker, I know. You can watch them sun-bath and play around rocks. With all the sun-bathing they do on the rocks, these seals tend to “overheat” and need to go for a swim to cool down. This is where my favorite part comes in. There is a company called Seal Swim Kaikoura that takes you to interact with wild seals. They hook you up with a wetsuit and snorkel mask and drive you out by boat. From there, they don’t do anything to coax the seals: no making noises, no food as bait. You just jump in the water and swim around — eventually, the seals get curious and start swimming around you. They are extremely playful and, in my opinion, jokesters. I swear that they swim around in circles to confuse you! Some also seem to enjoy making a beeline right towards you causing you to panic, then turn away at the last second secretly laughing at the human fools. Makes for some cool GoPro footage, but a little scary when you’re in the water since they are such strong swimmers. Unfortunately, all my GoPro footage is too shaky to show, but the above two photos were provided by the Company after we finished our tour. Gives you a good idea just how close and playful the seals get to the snorkelers. As a huge Lord of the Rings fan, Henry had marked down a bunch of sites for us to visit where filming was shot. One of those places was Mount Cook when the fellowship was trying to cross a mountain and Saruman was sending bad weather their way. Aside from the LOTR reference, Mount Cook, also known by the Maori as Aoraki, is the highest mountain in New Zealand. Surrounded by the picturesque Lake Pukaki, this is one of the most beautiful views I have ever seen. We just drove by and hung around for half an hour, but you also have the option of taking helicopter rides or hiking around. If you have camping gear, I highly recommend that at least one night, you choose a Department of Conservation campsite. Not only is it ridiculously cheap, it is ridiculously beautiful. Note that there are 6 categories of DOC campsites, but I recommend going to the ones labeled ‘Scenic’. The benefit is obviously beautiful locations that holiday parks don’t, and few (if any) hotels, have access to. The drawback is that the facilities are very minimal. We chose to stay our first night in Queenstown at Moke Lake campsite. No showers or flushing toilets, but we got to wake up to the most beautiful views. We night we stayed it was actually New Year’s Eve. We skipped the fireworks in the city center and opted for a mosquito-repellant light “campfire”, the whole group of campers huddled around playing the guitar and singing along. Of all the cities in New Zealand, Queenstown was probably my favorite. Bustling with shops and restaurants. Walkable. Clean. Safe. Beautiful. So many good adjectives to use! You also get to enjoy the beautiful compositions of the one and only Mathias the Piano Man. Mathias is a self-taught composer and pianist who now has 6 albums available for purchase. It was a great evening being able to sit by the water and listen to his music, while watch ducks waddle and birds soar, watching the colorful sunset of Queenstown. I hope you enjoyed my list of Top 5. Is there anything that didn’t make my list that’s a must do on yours? Let me know in the comments below!